The rich aren't paying their fair share? Attention equities: swap spreads are falling! As I glance through the news about real estate around the world, I am impressed that the reporting seems to be only from the Dark Side of the Force. Not trying to be blinded by what is obvious, I see immense lost alternatives to write about the countless opportunities that are presented by this unique set of circumstances. We may never see a market reset of this magnitude again in our lifetimes. It's a reset that is shaking up the entire globe, but it points us back to the simple things we teach our kids about keeping a balanced checkbook, the power of having some cash in your pocket, the value of working, the value of saving for the future, the obligations that come with debt, and the wisdom of keeping some dry powder for unknown events and opportunities. The opportunities around us may never be greater than they are today. Amidst the confusion and the really bad moods is a space of possibilities that is growing by the day. Having lived through a deep recession where mortgage interest rates were 17-19% instead of today's 5.5%, I see real estate that can't be duplicated at even close to today's prices—homes, lots, and buildings that offer a chance to go back 5-10 years in a time machine, knowing what you know today. Don't spend what you don't earn. Not one of them will lead you astray, but all of them point to the opportunities that are lying all around us right now, and which will continue to only get better as the money simply starts to flow again. Money is a fluid; it stagnates when it stops moving, but just as the rains come to cleanse the world—even just a sprinkle—so do the economies of the world benefit from the return of liquidity. Money is starting to flow again; it's time to prepare and get ready to irrigate the fields and look forward to another harvest, keeping in mind the lessons we have been taught for generations. Thanksgiving makes even more sense this year. One thing to give thanks for tomorrow: a less nervous stock market and higher prices. The VIX index has retreated significantly from its highs, and in less than a week the S&P 500 has climbed 18%. This chart comes from RealClearMarkets and is too good to not pass around. 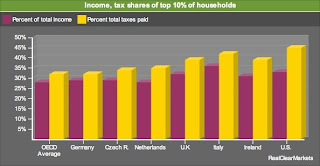 The yellow bars represent the share of total taxes paid by the top 10% of households, while the magenta bars represent the share of total taxes paid by those same households. The U.S. ranks as the most progressive country, with the top 10% paying fully 45% of all income taxes—"the highest tax-to-income ratio of any country." Corporations pulled back on their capital spending plans last month, as the second chart shows, and consumers pulled back on their spending. That's hardly news, since I don't know anyone who isn't more cautious these days about non-essential spending. What stands out however, is that capital goods orders today are at the same level they were at as we entered the last recession, yet corporate profits, as the first chart shows, have more than doubled since then. Corporations have therefore amassed a huge store of cash in recent years. Given the proper incentives (e.g., lower tax rates, accelerated depreciation allowances) and an improvement in confidence, we could see a burst of new investment in the coming years that could easily pull this economy out of its slump. There's a lot more money sitting in corporate coffers than Obama could possibly muster for his fiscal stimulus plan, and corporations could put it to work a lot faster than government bureaucrats could. Memo to Obama: don't limit your stimulus plan to government spending. Today the government released third quarter data on after-tax corporate profits. Profits fell, but only modestly relative to the second quarter, and profits were down only 7.8% over the preceding 12 months. Profits were 7.8% of GDP, way above their mean-reverting average of just over 6%. This chart takes the NIPA profits (which are distinct from GAAP profits, in that NIPA profits are based on actual tax filings by companies and are adjusted for inventory valuation and capital consumption allowances—thus making them similar to economic profits, whereas GAAP profits are accounting profits and can be quite different) and uses them as a proxy for corporate earnings. It divides those earnings by the yield on 10-year Treasuries to get the capitalized value of all U.S. corporations (blue line). It then uses the S&P 500 index as a proxy for the price of all corporations (red line). The model is similar in construction to the "Fed Model" of equity valuations, and is my version of a similar model that Art Laffer has used profitably for decades. What jumps out at you is the unprecedented degree to which stocks are undervalued today. The gap between these two lines has never been so huge. It's enough to make you question whether the model makes any sense at all, or whether there is something horribly wrong with the data. Or whether the stock market is just simply in the grips of a massive deleveraging panic that has driven valuations to absurd levels. Or maybe the 10-year Treasury yield is so artificially low due to panic conditions that it is inflating capitalized profits? To test whether the latter explanation is reasonable, it would take a 10-year Treasury yield of 10.4% to make the model say that stocks were fairly valued today. That's a big stretch. I'll stick with the conclusion that stocks are incredibly undervalued today for a variety of reasons, but even the sum of those reasons fails to fully explain what is going on. The financial market is still in the grips of panic, deleveraging selling; liquidity in the bond market is dismal; the ability of anyone to reliably quantify the risk of subprime-backed, asset-backed, and commercial real estate-backed securities is highly questionable; our government is in a state of flux; the threat of higher taxes on capital is real; the threat of protectionist policies is real. But even if Obama makes a series of blunders, one big thing distinguishes the current period from the Depression, and that is monetary policy. The Fed today is simply not going to allow the monetary contraction that crippled the economy in the 1930s. And although I dislike Obama because of his socialist instincts, I seriously doubt he is going to blindly make every mistake in the books. So I'm left with the conclusion that stocks are cheap. Last year's failed stimulus was temporary, targeted, and timely. A better plan (but not ideal from a supply-side or libertarian perspective) would be John Taylor's: permanent, pervasive, and predictable. Obama's recently proposed plan appears to be helpful, hopeful, and humongous. Critics fear it might end up being pointless, political, and pork-filled. Larry Summers now calls for stimulus that is speedy, substantial, and sustained. Hardly ringing endorsements. Message to Obama: your current proposal is a non-starter. Go back to the drawing board and start from scratch. Measures of fear such as the VIX and swap spreads are falling, and that is very good news since it reflects reduced systemic risk and improving fundamentals in general. Equity prices have bounced from their recent lows, but appear to be lagging the improvement in these key indicators however. Perhaps it's just because this is a holiday week, or perhaps the market is still trying to digest the news from the Obama camp. I detect very little enthusiasm (and rightly so) for Obama's big plans for fiscal stimulus, but his nominees are not crazy people who are likely to do stupid things. More information is needed. John Tamny has a good article which explains how all the command-and-control in Obama's plans have dampened investor enthusiasm, and he also offers sensible suggestions for improvement. Obama needs to reflect some more on what sort of fiscal plan makes the most sense and triangulate accordingly. With all the smart people lining up behind him, you would think they could figure this out. I hope so. Growth in the exports of U.S. goods and services is one of the most positive aspects of the U.S. economy these days. Exports have been growing at double digit rates, thanks to strong demand from the rest of the world. Imports have slowed significantly, thanks in part to lower oil prices, but mainly due to the housing-led slowdown in consumer demand. This all reflects a massive shift in the economy's resources away from housing and towards export-oriented industries, which is a very positive development in itself. That both exports and imports are still following a rising trend relative to GDP is also positive, since that reflects increased global trade, which in turn enhances living standards worldwide because it makes economies more efficient. More good news today: the Case Shiller index of home prices continues to fall. This chart shows the inflation-adjusted value of the index according to my calculations, plus a projection for where the year-end value will be. So far, prices in real terms are down by 27% from their peak. By year end, prices could be down by 30%. That might be enough to call a bottom, but perhaps they fall a bit more; in any event we have seen a substantial correction in prices and a consequent significant improvement in affordability. I have a more detailed discussion of this subject here that points out the severe lagging nature of this index among other things. The first sign of improvement in the fundamentals was a decline in 10-year swap spreads, which fell to "normal" levels in the third week of September. Short-maturity spreads remained extremely high, however, and agency spreads rose last week to a new, exceptionally high level. Today these laggards are beginning to catch up, thanks to the Fed's announcement today that they will purchase up to $100 billion in GSE debt and up to $500 billion in mortgage-backed securities backed by GSEs. This is another in a series of government efforts to break the logjam that has been frustrating the fixed-income market. As I remarked when swap spreads first started to normalize, this is evidence that the government's efforts are gaining traction. As such, I think this is very positive for the outlook for all financial markets, since it enhances liquidity and reduces uncertainty, fear, and doubt. With the Fed about to become a buyer for agency debt and mortgage backed securities, the yield on FNMA and FHLMC guaranteed mortgages has dropped by 55 bps today, which should mean that 30-year fixed mortgages should soon be available at 5.5% or so, which would be about the lowest rate available in many years. Lower financing costs and lower housing prices combine to produce a signficant improvement in housing affordability, and this in turn offers the promise of increased housing demand on the margin. The sooner prices stabilize the better for everyone. I suggested a few weeks ago that the big decline in short-maturity swap spreads was a good leading indicator of a coming rally in high-yield (i.e., junk) bonds. So far that prediction hasn't born fruit, as this chart shows. But I also noted that sometimes the lag between swap spreads and other spread assets can be significant. It may well be the case that junk bonds are just going to be slow to react to what I view as a significant improvement in the underlying fundamentals. Be that as it may, with junk bond yields now well over 20% (Lehman says the average junk bond yielded 22% last Friday, whereas Bloomberg says it was 25%), it's time to look at these bonds in isolation. Junk bond yields have never before been this high. Just what does that mean for an investor? According to Moody's, the current default rate for junk bonds is about 4%. They expect it could rise to 10% by the end of next year, which is close to the all-time high cumulative default rate in the Depression of 14%. Let's say their decidedly pessimistic assumptions are right. Now, considering that defaulted junk bonds are likely to have a recovery value of at least 30% (which is very conservative), that means that an investment in junk bonds today is likely to incur losses of 10% * 70%, or 7% over the next year. In other words, you would lose 10% to defaults, but recover 3% of that as the defaulted companies liquidate their assets. So if you buy junk bonds today that are yielding, say, 22%, you can expect to receive, over the next 12 months, an income return of 22% less a loss of 7%, for a net return of 15%. And that's using some pretty pessimistic assumptions. What would it take for an investment in junk bonds today to equal the essentially zero rate of return on cash today even if default rates are horrendous? The yields on junk bonds would have to rise from 22% today to about 26% for the one-year holding period return of junk to equal the current yield on cash. That's because an increase in the yield on junk bonds of 4 percentage points implies a price drop on those bonds of almost 15%. So things have to deteriorate meaningfully for an investment in junk to equal an investment in risk-free cash. If junk yields don't increase at all, they will produce a return of 15% in the next year. If junk yields decline from 22% to 20% (a drop in the bucket if things in general start to improve), then junk returns will be almost 23% in the next year. If junk yields don't increase for a month, then an investment in junk bonds will produce a one-month return of at least 1.2%, which beats the annual yield on most money market funds! How much longer can investors ignore these numbers? In short, it's not enough to be pessimistic these days in order to be bearish on the prospects of corporate bonds and equities. You have to be downright convinced that conditions in the next year are going to be far worse than anything the U.S. has ever seen. As for investor psychology, all it would take for things to improve signficantly is for them not to deteriorate. Because if current yields hold steady, the returns to taking risk will rapidly undermine the confidence of those who are hiding out in cash. This chart is a good way to judge the depths of the market's recent despair. 10-year Treasury yields last week fell to 3%, which was the level they traded at during the early years of the Great Depression. 2-year Treasury yields fell to 1% last week, which implies that the market expects the Fed funds rate to average 1% (it is 1% now) for the next two years; presumably this means the Fed will cut rates to 0.5% at its next meeting, then keep them there for a long time before slowly raising rates to 2-3% some 18 months from now. In short, Treasury yields are telling us that the market holds virtually no hope for any meaningful economic recovery in the next few years, and is powerfully concerned that we are in for a repeat of the Depression of maybe even worse. With fear so enormous and yields so incredibly low, an investor knows that the market is extremely vulnerable to any positive surprises. If things don't prove to be disastrous, then equity prices are likely to rise and Treasury yields are likely to rise. Indeed, owning cash, Treasury notes, or Treasury bonds is one of the riskiest things I can think of in this environment. You earn almost nothing in interest, and you could potentially suffer huge losses if the economy experiences even a modest recovery (because yields could rise significantly, pushing Treasury prices lower, while other things you don't own rise in price). As an example, the news that Obama is picking economic advisors (more on this in a subsequent post) that are smart and experienced (as opposed, I suppose, to mindless idealogues) was enough to push 10-year Treasury prices down by 3% in the past two trading sessions—enough to wipe out a year's worth of interest! Over the same two-period, the S&P 500 index is up 10%. I read the headline today ("U.S. home resales tumble") and thought, oh boy, this doesn't sound very good. Then I checked the data and updated my chart, above. Well, things are not collapsing at all. Home resales have been essentially flat for the past 13 months! That's excellent news, I think, because it means we are finding a bottom in the housing market. The other part of the headline said that prices fell the "most on record." Whoa, that sounds grim, but it's actually great news. The faster we get prices down to a level that clears the market, the better. Construction has been falling for the past three years. The median sales price of existing homes has fallen over 20% from its peak, and is back to the levels of March '04. Prices will undoubtedly have to decline some more, but most of the pain of falling prices is now behind us. The housing market is fixing itself, and the bottom is getting ever closer. Obama needlessly stirred the pot by warning today that "millions of jobs" could be lost next year and that "we now risk falling into a deflationary spiral." Furthermore, he warned that "it's likely to get worse before it gets better." Not exactly inspiring, nor likely to restore badly needed confidence. Investors whose portfolios have been devastated can now look forward to digging ditches, paving highways, pouring concrete and painting classrooms. Excuse my skepticism, but I guess I didn't realize that decaying infrastructure, inadequate classrooms, and not enough Honda Civics were the root cause of the current crisis. I'm led to revisit my concerns of early October. The market's collapse began around the time (late September) that an Obama victory began to be very likely. If another New Deal is the best he can come up with, then I can understand why the market is down. UPDATE: The good news would be that he didn't mention raising any taxes. So as I thought before, he will probably allow the Bush tax cuts to expire on schedule at the end of 2010. No new taxes, no higher taxes, for the next two years. Tim Geithner is a safe pick, and I think the market celebrated the news today because it eliminated some uncertainty. He's been intimately involved in crisis management this year as head of the NY Fed, so he brings continuity to the process, and at times like this that's probably better than holding out the prospect of a brand-new player. He seems to be a consensus player, but he doesn't have original or out of the ordinary views on why we got into this mess to begin with. We don't know if he believes that lower taxes are better than higher taxes, for example. Presumably he shares many views with Larry Summers, which is probably good, since Summers was in favor of free trade and a strong dollar. He's not likely to do anything radically different than what we've seen out of the Paulson camp this year. But he's also not likely to bring new thinking to the table either. It would be nice if he came out strongly in support of a strong dollar and a more stable Fed monetary policy designed to give the dollar's value priority above economic growth. But at least he is not a neophyte and thus shouldn't prove too destabilizing. I've been a devoted fan of gold for a long time. Over the years (actually over the centuries), gold has been a sort of canary in the coalmine, warning of us whenever there are imbalances between the supply of and the demand for money. As this chart shows, gold has tended to forecast where inflation is headed about one year in advance. What it's saying right now is that all the talk about deflation is way off base. Sure, we know that the recent huge decline in energy prices will knock at least several points off the CPI, but that doesn't mean all prices are going to fall. Lower energy prices could make it easier for other prices to rise, for example. And there has been no tightening of monetary policy and no shrinkage in the demand for money at all, and those are the things that are generally sure-fire signs of declining inflation to come. Besides, we've already seen that non-energy producer prices continue to rise at an above-average rate. I can't guarantee that what this chart is predicting will come true, but it's hard to see how we are going to get years of deflation (as the bond market is now predicting) when gold prices are hovering around $800, about double its long-term average inflation-adjusted price. Real deflation only threatened after gold prices fell below $300 in the late 1990s. This market is priced to another depression, as I've outlined in prior posts. Implicit in market pricing is a massive wave of bankruptcies affecting as many as half the companies in existence today over the next five years, the result of a signficant contraction in economic activity on top of deadly (for debtors) deflation. The deflation is expected to last up to five years, while the a price level in 10 years is not expected to be any higher than it is today. To see how potentially wrong the market's expectations of deflation could be, just consider these charts. The Depression of the 30s was exacerbated by a Fed that allowed the money supply to contract. Fed Chairman Bernanke has vowed repeatedly that such a mistake is not going to occur on his watch. And he really means business: as the second chart shows, the Fed has sextupled the basic money supply (bank reserves) in the past two months. The Fed has created six times more raw, high-powered money in the past two months than it created in its entire existence! This simply breath-taking, for want of a better word. And when people say credit markets have shut down, the facts contradict them. Non-financial commercial paper outstanding has been growing steadily for the past four and a half years. Companies are having no problem accessing the credit markets. All measures of the money supply and bank lending, for that matter, are at or very near all-time highs, as of the latest data available. The stock market has collapsed, down 38% from September 26, and down 52% from its high of October 11, 2007. This ranks as one of the worst markets in history. So you'd think that the economy would be absolutely miserable, right? But it's not, according to this chart. This plots the ratio of weekly unemployment claims to the total amount of people working. As of the end of October, this barely ranked as a modest recession. We're far lower today (actually about 50% lower) than the ratios which prevailed in most recessions in recent decades. It would seem from all the gyrations of late surrounding the question of whether or not Detroit will be bailed out, that the failure of GM and Ford would put a huge segment of the working population at risk. But that is an exaggeration. There are many ways a GM and Ford bankrutpcy could be resolved that wouldn't have a significant impact on the U.S. economy. Simply renegotiating existing labor contracts could save most of those jobs. But even if their plants close, the economy will continue to function. Other automakers would step in the to fill the gaps that GM and Ford might leave. The panic reflected in the market these days is unwarranted. Holman Jenkins has a great article today in the WSJ which reminds us that the recent election was chock-full of delicious ironies. Obama campaigned on an ambitious platform to extend the bounties of government to the masses in the grand tradition of FDR's New Deal (e.g., universal healthcare, income redistribution from rich to poor, discretionary monetary and fiscal policy to smooth out the vicissitudes of the business cycle, government-funded technology to save the planet, massive public works projects to upgrade our infrastructure, union-protected jobs to keep greedy capitalists at bay) but he is now faced with the disastrous consequences of those very same programs. The origins of the crisis we're living through can be traced back to a variety of government-led or -sanctioned intervention in free markets: housing and mortgage subsidies which inflated property values and facilitated excessive leverage; Freddie and Fannie themselves, which used their taxpayer backing to assume $1 trillion in debt; Federal Reserve manipulation of interest rates, which led to a highly unstable dollar and asset prices; a highly progressive tax system which left federal finances hostage to cyclical tendencies in the economy; and parasitic unions that have all but killed their Detroit automaker hosts. To name just a few. Mr. Obama won't be building a legacy as the new FDR, but cleaning up after the last one. Fannie Mae was a New Deal creation. The UAW was born in 1935. For decades the UAW steadily traded away domestic auto market-share to imports and transplants to keep its aging membership toiling away toward their golden pensions and collecting wages and benefits twice those of their competitors. It worked for a while . . .
Fannie and its twin, Freddie Mac, have already come back for a second helping of taxpayer money as their once-profitable business model devolves into a politically directed subsidy machine for propping up home prices and delaying foreclosures. Their next meltdown, in government hands, is all but written in the cards. AIG, an otherwise healthy insurance company that went bust betting on housing debt, has already consumed taxpayer loans and capital injections nearly as big as AIG's $200 billion market cap when it was one of the world's most admired firms. AIG still has a valuable insurance business, but ignoramuses in Congress and the press are busy destroying it. It will take years for the government to get AIG off its hands, and there likely won't be much value left for taxpayers when it finally does. But the really giant sucking sound is the auto sector, getting ready to gobble up whatever hopes Mr. Obama might have had for an ambitious, forward-looking presidency. He and Nancy Pelosi naturally insist that any "bailout" must hit multiple bogies. They want UAW jobs to be preserved. They want the shibboleth of energy independence advanced. They want "green" cars to please the Tom Friedmans of the world. All this makes sense to a politician, but not to any practical person, who knows that multiple bogies are bound to be conflicting bogies. Those giant legacies of existing New Dealism known as Social Security and Medicare worked for a while too, but now their expected revenues are (in present value) about $99.2 trillion short of the expected outlays required to assure present and future workers their promised comfort in retirement. Mr. Obama envisioned himself extending FDR's work. He may end up finishing George Bush's. So many things are cheap today it's hard to know where to start. I highlight TIPS because they represent a unique asset class, and they don't get much attention. TIPS today offer a real yield of more than 3%, guaranteed by the US government, for the next 10 years. That's very attractive, since there are not many 10-year periods in the past in which you could have earned a 3% annual real yield, and that's after the fact. Now you can lock in a 3% real return for the next 10 years with TIPS. TIPS also offer to pay you whatever the rate of consumer price inflation happens to be. And if you buy a recently issued TIPS and hold it to maturity, you are protected against deflation. If Treasury bond yields ever rise from their incredibly low levels of today, TIPS yields are likely to fall, and that will further boost the return you get on owning TIPS going forward. Why? Because Treasury yields are likely to rise if and when the economy recovers. A recovering economy will quench the current fears of deflation and make inflation hedges like TIPS more attractive, and that in turn will mean lower real yields and higher TIPS prices. TIPS today are cheap mainly because the market believes that inflation will be nonexistent over the next 10 years. That's the red line in the second chart, the difference between 10-year TIPS yields and 10-year Treasury yields. I've pointed this out before and it bears repeating: the bond market has been underestimating inflation for the past 10 years, and there's a good chance it is underestimating future inflation. The Fed is trying as hard as it can to reflate. Bernanke's career reputation rests on his ability to avoid deflation. Yet the bond market is anticipating deflation will be with us for at least the next several years. In my experience, I think you can never underestimate the ability of the Fed to get what it wants. Buying individual TIPS can be expensive for small investors due to big bid/ask spreads. You might consider instead a mutual fund such as the iShares Lehman US Treasury Inflation Protected Securities Fund (TIP). 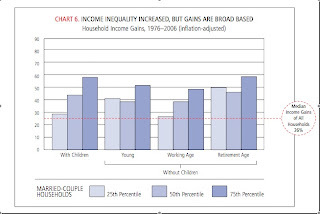 Terry Fitzgerald at the Minneapolis Fed has a nice study out that refutes the popular notion that the rich have benefited at the expense of the poor and middle class. "The incomes of most types of middle American households have increased substantially over the past three decades. But the outsized gains of the rich do not mean that middle America stagnated." I've been through several bear markets (1987, 1990-91, and 2000-02), but this one takes the cake because it just keeps going. As soon as one key fundamental turns the corner (e.g., swap spreads declining), something else rears up to take its place. In the past week or two, one new problem has arisen in the market for the debt of GSEs (e.g., Freddie and Fannie), with the spread between their yields and Treasury yields blowing out to unprecedented levels, as shown in this chart. I mentioned this problem three weeks ago, before things got really crazy, and thought it would be fairly easy for somebody in Washington to put the market's fears to rest by making the government guarantee of Agency debt more explicit. But things have only gotten worse since then; the market is in full panic mode. Another recent problem is the apparent meltdown in the market for asset backed and commercial mortgage-backed securities (ABX, CMBX). The selling is intense, and the pirates are pouring over the transom, as one former colleague puts it. I don't have a good explanation for what is going on, but I'm tempted to blame this latest problem on foreigners and not deteriorating fundamentals (the news has been so awful for so long that it's hard to see how the fundamentals could get much worse). Foreign central banks, sovereign wealth funds, and foreign insurance companies have accumulated gigantic volumes of our debt (most of which was rated AAA when they bought it) in the past decade, and those funds are being managed in most cases by people who have never lived through a financial crisis or have never managed risky assets. Agency debt was once thought to be virtually risk free, but now it is behaving almost like BAA corporate debt behaved in the 2000-02 period. That is a shocking reality that has destroyed the confidence of investors all over the world. In short, there is not a great deal of institutional memory or expertise overseas, whereas the collective wisdom of Wall Street and large U.S. institutional money managers runs deep and spans decades. As a result, and in my experience, foreign money managers tend to be trend-followers, not contrarians. Being a trend-follower in today's market has been a good thing, because the selloff has been long and extended. Selling has saved people lots of money. So now, despite the fact that many prices are absurdly low, any bit of bad news, including news that prices are falling, invites a new wave of selling. Just put yourself inside the head of an overseas money manager in charge of many billions of dollars of asset-backed securities that were once considered almost gold-plated. If you sold 3 months ago, you are a genius, but if you don't sell today on bad news and prices end up going lower, you will be branded a moron by your superiors. How could anyone not understand that this is a bear market of unprecedented proportions? Bad news must always be a reason to sell. This can go on mindlessly, but at some point most of the selling will have been done. At some point the economic news will start to get less bad, and here and there we will see glimmers of improvement. And at that point we can expect to see prices head much higher. I just wish I knew when that point will come. GM and Ford are together worth all of $5.5 billion, according to the stock market today. What sense does it make to pour $25 billion into keeping them alive a little while longer? Now their execs are trying to scare us into helping, arguing that a collapse would be "catastrophic" for the economy. But as far as the market is concerned, it's already happened. The best solution would be to have some other auto company come in and buy their assets out of bankruptcy, then start up the plants with lower wages. That would make them instantly competitive. The bond market is feeling better these days, with swap spreads, the TED spread and implied volatility down significantly from their recent highs, but the stock market is still in the grips of a paralyzing fear, as this chart reminds us. This chart divides the VIX index (a measure of fear) by the yield on the 10-year Treasury note (a measure of the demand for safety). The bigger the ratio, the worse the panic. It looks like the threat of protectionist policies has receded, and that is very good news. Anonymous Obama advisers say he will go slow on his promised unilateral renegotiation of Nafta. Barack Obama, who threatened during the presidential campaign to withdraw from the North American Free Trade Agreement unless he could renegotiate it, may delay reworking the accord as he focuses on the U.S. economic crisis. After he becomes president in January, Obama will order a study on the world’s largest trade agreement, then seek longer- term negotiations with Mexico and Canada on how to change it, according to three advisers, who spoke on condition that they not be identified. UPDATE: The NY Times is urging Congress to pass the Colombian free-trade agreement! Good news on top of good news—will wonders never cease? Today's inflation news—an unexpectedly large drop of 2.8% in October producer prices—was cheered by many as a sign that inflation pressures have vanished. The bond market figures that with collapsing energy prices and a weakened consumer, prices will actually fall substantially before this is over. That explains why the TIPS market today lowered its inflation expectations over the next 10 years to an all-time low of 0.7% per year. For the next 5 years, however, TIPS are priced to inflation averaging about -1% a year! So according to the bond market, we were wallowing in inflation just a few months ago but now deflation is all but inevitable. I'm not so sure. As this chart shows, core inflation (taking out food and energy) has been rising steadily for the past two years. So the big source of the decline in "headline" or total inflation is simply falling energy and agricultural prices. If we were really headed for a general deflation, then core price inflation ought at least to be declining, but it's not. The big difference between this recession and all previous recessions is that it wasn't produced by a tightening of monetary policy. Money has been plenty easy for the past several years, and the Fed today has pulled out all the liquidity stops. In every other recession we've had, inflation has fallen significantly not because the economy was weak, but because a shortage of money was the root cause of the weakness. This adds up to reasons to hold off on celebrating the demise of inflation, and it suggests again that TIPS might be a worthwhile addition to your portfolio. Real yields are in very attractive territory because with deflation expectations rising, no one cares about TIPS' inflation protection. If inflation persists, however, TIPS will come roaring back into favor, and they will also deliver very attractive yields. I just updated this chart and although I know that campaign season has passed, this issue is still extremely important. The notion that the rich aren't paying their fair share of taxes is simply untrue at best, and blatantly misleading at worst. The top 10% of income earners in 2006 (latest data available) paid 70% of federal income taxes, the top 5% paid 60%, and the top 1% paid fully 40%. The Tax Foundation is chock full of this type of information. If ever there was a chart that proves that the Laffer Curve works, this is it. Over the period covered by this chart, the top marginal rate on upper income tax earners dropped in half, from 70% in 1980 to 35% today, yet the share of total taxes paid by this group has gone up by 40%. As the old saying goes, "tax something less and you will get more of it." Lower tax rates reduce the incentive to avoid taxes, while also increasing the incentives to work harder, to invest, and to take risk. It's a win-win for all concerned. Raising tax rates on the rich risks reversing this virtuous process, akin to killing the goose that lays the golden egg. For a change of pace, here's another look at how currency values are becoming more reasonable. I've done this for the Canadian and Australian currencies, and now for Sterling. I've been keeping track of major currencies and their purchasing power parities (PPP) for decades, and I am always happy when the PPP I have calculated ends up being the central tendency for the currency itself over time. PPP doesn't work on a short-term basis, and it doesn't always help you predict the direction of currencies, but it really can give you a good measure for how cheap or expensive a currency is at any given point in time. I've spent a lot of time in the UK over the past 15 years, and most of the time London has been expensive from my perspective. Things are now more reasonable with the pound trading at $1.50. The larger theme with currencies and commodities that I have been talking about is that most of them were trading at pretty high levels not too long ago, and now they have suffered significant corrections. But rather than becoming cheap, I think it's the case that they are now no longer expensive. The valuation extremes have all but disappeared from commodities and currencies. The big extreme remaining to be corrected is the undervaluation of corporate bonds and stocks. Is this the end of the world or the opportunity of a lifetime? Either the markets are right and the end of the modern world as we know it is right around the corner, or corporate bonds and stocks are absurdly, grossly and egregiously undervalued. I say that because the pricing today of corporate bonds and stocks assumes that we are entering a period that will be significantly worse than what occurred during the Great Depression of the 1930s. At the risk of simplifying a complex subject, the Depression was largely the result of a massive contraction of the banking sector and money supply, a massive contraction of world trade set in motion by the Smoot-Hawley Tariff Act of 1930, a massive increase in government intervention in the economy, and a massive increase in taxes meant to offset a similarly massive increase in government spending. 1929-1933 was by far the worst period. The economy shrank by 26.5% in those four years, and prices on average fell by 25%. This was a nightmare for anyone with debt, since economic activity collapsed and dollars became much more expensive to acquire. By 1936, the peak year for cumulative defaults, about 14% of all corporate bonds were in default, according to the National Bureau of Economic Research, making it the worst corporate bond disaster in U.S. history. According to Lehman data, the current level of spreads on investment grade bonds implies that about 9% will be in default within five years, and fully 70% of speculative-grade bonds will be in default. That further implies that 24% of all corporate bonds currently outstanding will be in default within 5 years. If only 14% of firms defaulted on their debt during the depths of the depression, what sort of economic conditions would it take for almost one-fourth to go out of business? Tim Bond, an economist at Barclay’s Capital in London, has calculated that the current level of spreads on corporate bonds (which is by far the highest ever recorded—600 bps on investment grade, and 1700 on high-yield bonds) implies 3-4 years of a 15% annual contraction in GDP. That would be about twice the average 7% annualized rate of contraction during the worst period of the Great Depression, 1929-1933. According to my model of equity valuation, which I have discussed here, and which is a variant on the Fed Model and Art Laffer’s model, the stock market is assuming that corporate economic profits (as calculated in the National Income and Product Accounts) decline by at least two-thirds over the next few years. In relation to GDP, that would put them 25% lower than the worst period (1974) since they were first measured (1959). Any way you look at it, the pricing on corporate bonds and stocks today implies that the next several years will be the most disastrous in the history of the U.S. In order to fully appreciate why that prediction is unlikely to prove correct, consider that not one of the key ingredients that precipitated the depression exists today. Although we do have a banking crisis, the Fed has taken incredibly aggressive steps to prevent a monetary contraction or deflation from occurring. Indeed, as I have noted repeatedly, there is more money and bank lending in the world today than ever before. World trade has expanded greatly since the depression, and an outbreak of widespread protectionism in the near future seems like a very remote threat. We have had some meaningful increases in government spending, but so far we have not seen any attempt to raise taxes. For the market's fears to be realized, I think the Obama administration would have to make just about every conceivable mistake in this regard, and not only quickly but massively. If that doesn't happen, then this is the buying opportunity of a lifetime. Retail sales were ugly in October, and this chart puts it into perspective. Some of this is due to lower gasoline prices, which is good, but in general it reflects a shell-shocked consumer. Aren't we all trying to cut back on unnecessary expenditures given the uncertainties out there? If confidence can return, sales can pick back up. The more I think about it, the more I'm intrigued by something I said on this issue yesterday. In short, the problem with Detroit can't be fixed with a bailout or with loans or with infusions of capital, because Detroit's biggest problem is the UAW and absurdly high labor costs. The unions seem determined to cling to these high costs, even as the Big 3 slide towards irrelevance. But this doesn't mean that the Detroit auto industry has to go down a black hole. They could all declare bankruptcy, sell their assets to some Japanese automaker, and the plants could reopen in days and rehire everyone at a competitive wage. This is very similar to the housing/subprime crisis. Houses are worth less than their owners owe, so eventually a lot of those owners will stop paying and their homes will be sold in foreclosure, or if they are lucky their banks will reduce the amount they owe so that once again they have an incentive to pay. The painful part of all this is that someone has to eat the losses. 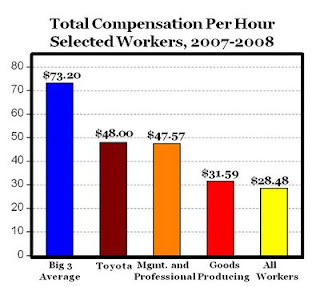 In the case of Detroit the auto workers are going to eventually have to accept lower wages. In the case of the housing market, lenders will have to accept losses on the loans they hold (a process that is well underway). But once these losses have been accepted, the assets are effectively redeployed. New owners can buy homes they can afford, while those who get debt relief can continue to live in their house and have hopes of building equity again. Most importantly, life can go on. No homes are destroyed, and no jobs are destroyed. Some wealth is destroyed, but even if the losses on homes with subprime mortgages in the US total $1 trillion, that is a drop in the bucket compared to the $50 trillion or so of households' net worth. Please leave comments if this piques your interest. Whatever ails this economy, it is most definitely not a shortage of money or a credit squeeze. This chart shows just how dramatically the Fed has responded to the subprime crisis. In the past eight weeks, the amount of bank reserves—which the Fed creates by buying securities—has increased from $98 billion to $467 billion. That's an increase of 376%, almost a quintupling of the raw material for the world's supply of dollars. The Fed has created four times more high-powered money in the past two months than they created in their entire history. The Fed is not necessarily creating the preconditions for a hyperinflation. They are responding to an enormous surge in the demand for money by supplying what the market desperately wants. Presumably they will take this money back out of circulation once conditions normalize. As long as the supply of and demand for money are in balance, there is no big inflation problem. At the risk of potentially creating too much money, the Fed is making sure that that no one will be able to blame them, as many blame the Fed back in the Great Depression, for allowing a monetary deflation to take hold, since that could seriously aggravate the current crisis. Every measure of the money supply, (e.g., currency, base, M1, M2) is at or very near a record high. Total bank lending is at or very near a record high. Commercial Paper continues its rising trend that began four years ago. Commercial & Industrial loans made by banks to small and medium sized companies are at all time highs. As I've said many times here, there is no shortage of money, nor any shortage of credit on an economy-wide basis, despite the continuing popular perception that banks are not lending and the economy is being strangled for want of credit. The problem continues to be a shortage of buyers, and that has a lot to do with a lack of confidence. Faced with tremendous uncertainty and a barrage of bad news, everyone is pulling back. But they could just as easily regain their confidence and start spending again. This is not a scenario that leads us to the end of the world as we know it, but that is what the markets are braced for. Budget numbers for October came out today, and the big news was a huge increase in spending. That has put the federal deficit over the past 12 months at $618 billion, about 4.3% of GDP. Deficits typically increase during recessions, but this time the spending is being aggravated by bailouts, and we haven't seen the end of this story yet. Deficits still haven't reached the level of the early 1980s, and even if they do, it is still not reason for alarm. A budget deficit of 5-6% of GDP is not going to sink the U.S. economy all by itself. So far the government is not having any trouble whatsoever funding the deficit through the sale of T-bills and T-bonds. Indeed, the market is so hungry to buy Treasury debt that interest rates are at amazingly low levels even as the deficit has exploded. It's all one big capital market, so it seems reasonable that whatever fear that afflicts the fixed-income side of the market should also afflict the equity side. This chart shows that the volatility of the fixed-income market does indeed track closely that of the equity market. If anything, the bond market might be a little faster to pick up on things than the equity market, judging by the fact that bond vol picked up a few days before equity vol did in September. In recent days bond vol has subsided, yet equity vol has spiked (and today the S&P 500 plumbed a new intraday low). Spreads on corporate debt peaked on October 10th, the same day the stock market first collapsed, and it makes sense that both equity and corporate debt prices should have bottomed at the same time. But now we see that corporate debt spreads have fallen meaningfully in the past month (meaning corporate bond prices have risen), yet equity prices have now hit new lows. Maybe it's another example of the bond market leading the equity market. The equity market typically gets all the attention, but the bond market is just as big and just as important. There's a potentially bullish signal here for the equity market: it should follow the lead of the bond market and chill a little. I have read just about everything Michael Lewis has written (Liar's Poker being the most famous), and he's very good. I would highly recommend his latest article. It's called The End and it's all about how the subprime mortgage crisis wiped out Wall Street investment banks. But certain things he exaggerates, and certain key things he leaves out. You hear a lot of politicians and pundits talking about how the housing crisis is the result of greed and stupidity on Wall Street and the failings of the free market. But the entire world operates on the principle of greed: you can always expect the majority of the people to act in their own self-interest. So blaming the housing/subprime crisis on greed doesn't really shed any light on the issue, because disasters like this don't come along very often, and our unparalleled prosperity today is the result of the fantastic advances that free markets have made over the years. As for stupidity, yes, many stupid things happened. Many. At all levels of the banking and investment world as well as at the highest levels of government. There's an important fact which Lewis left out in his article, and that is that subprime loans never would have been made in such volume were it not for the unique role of Freddie Mac and Fannie Mae. They were the kings of greed, if you will. They were owned by shareholders and managers, so they could reap all gains for themselves, but uniquely, any losses they suffered would be born by the taxpayers. Lewis makes fun of how investment banking firms found the ultimate way to screw people (by going public and passing all the risks from private owners to public shareholders). But Freddie and Fannie were by far the more obscene scam. And whom do we have to thank for that? Our friendly congressmen and senators who first created F&F and then worked diligently over the years to keep F&F insulated from any constraints on their ability to leverage up their portfolio at the taxpayer's expense. Politicians were the incredibly stupid ones, and they did it all in the name of making housing more affordable. They pointedly ignored dozens of warnings by serious people of an impending F&F disaster for well over a decade. If F&F hadn't bought $1 trillion of the AAA tranches of subprime loans, responding to the urgings of Congress, I feel confident saying that the bulk of those loans would never have been made. And without all those loans we never would have found ourselves in this mess, even if housing prices collapsed as they have. I remember learning about the AAA tranches of securities backed by subprime loans when I worked at Western Asset some years ago. They weren't all that attractive, which is why the firm invested only a paltry amount of clients' money in them, and then only after persuading Wall Street to make the securities doubly AAA by adding extra credit enhancements. In order for an investor to lose any of his principal in these loans, as I recall about 70% of the underlying loans would have to default, assuming a recovery rate (selling the house in foreclosure) of 50%. It seemed almost impossible that those loans could go bad, and we were fully aware at the time that housing prices could decline 25-30% (which they haven't yet done). Yet we invested only a tiny amount in AAA loans, just a few percent of assets. F&F invested $1 trillion, which was a huge portion of its total assets. Most of those loans are trading at a fraction of their par value, but not all of them have suffered actual principal loss; a good portion of the losses are so far only mark-to-market losses. A good portion of those securities could still pay off at or close to par, with only modest losses, if held to maturity. But given F&F's enormous taxpayer-backed leverage, even small losses were enough to turn them into a ward of the state. Lewis also left out a more thorough description of credit default swaps. He wants the reader to believe that the key to the great unravelling and implosion of the mortgage mess was the ability of Wall Street to create synthetic mortgage CDOs—via credit default swaps—that magnified hugely the risks of a downturn in the mortgage market. Yet if you look closely at the huge notional amount of credit default swaps tied directly or indirectly to subprime loans, you will find that the net exposure is only a tiny fraction of the much-ballyhooed total. That is the case for all swaps, in fact. Derivatives such as credit default swaps don't magnify the total amount of risk in the system, they redistribute it. Granted, if the housing market collapses as it has, there will be hundreds of billions of losses, but the losses are ultimately traceable almost in their entirety to the equity that has been wiped out on the mortgages. And we know that those losses are finite, and can't be more than $1 trillion in the worst of cases. We've already seen the bulk of the losses, as I've mentioned before. Lewis leaves out another important fact: as is the case for all derivatives, credit default swaps are a zero-sum game. For every loser there is a winner. So if a whole herd of investors were wiped out because they sold protection on subprime mortgages, then there's a herd of equal size that has been hugely enriched. He writes a good story that grabs any reader. But just as he relates how an astute investor friend always asked the salesman how Wall Street was going to screw him if he bought what was being offered, I would advise the reader of any gripping true-life story to ask himself just what the author is leaving out that might ruin the brilliance of the story. In real life things are never as clear as they are when you're telling the story after the fact, and every storyteller has his own agenda. One final note which illustrates where the true stupidity of all of this lies. You can bet a lot of money that subprime loans won't again see the light of day for a generation at least. And you can bet that the uninformed press, public and politicians will continue blaming the free market for this mess, rather than a series of grievous errors on the part of our politicians and bureaucrats. The free market doesn't make the same mistake twice, but the same logic does not apply to the government. Are not the same politicians that protected F&F now in charge of the bailout? Moral of the subprime story: without the help of our political system this crisis would not have happened. I sure hope this chart ends up working. Swap spreads continue to decline across the board, and that should be very good news for financial markets in general, since it means that confidence is rising, fear is declining, and liquidity is returning to the fixed-income market. Equities have yet to figure this out, unfortunately. Right now everyone seems obsessed with the likelihood that politicians will continue to make mistakes. 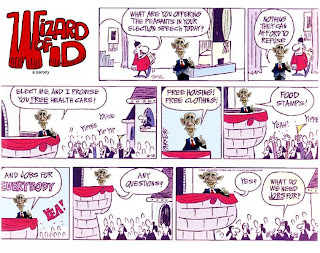 Call it fear of bumbling bailout bureaucrats, and fear of Obamanomics. Message to Obama: keep a sharp eye on the markets. They are telling you that GM bailouts, a refusal to sign free trade agreements, and a threatened increase in taxes on capital and the wealthy are not a prescription for recovery. Amity Shlaes has a great article today that draws on the lessons from the Depression. One reason the Depression lasted until World War II ... is that the New Dealers sabotaged their own plan. With one hand the New Dealers gave, spending to stimulate the economy. In fact, they put through the same kinds of infrastructure projects that Obama and congressional Democrats are considering today. With the other hand the New Dealers took away, by raising tax rates -- just as the new president and Congress are likely to do in 2009. The Clinton years also offer a tax story. President Bill Clinton raised taxes, of course, but not back to pre-Ronald Reagan levels. His late 1990s capital-gains rate cut, enacted with the Republican Congress, helped make the decade sizzle. In Ireland, unemployment began to drop following cuts in the personal income tax. It rose again before falling dramatically as the Irish government cut capital-gains taxes and then corporate taxes. It's worth noting that Ireland was enduring Depression-level rates of unemployment -- 16 percent to 17 percent -- at the outset of its tax experiment and managed to get down to the five- percent range even as the nation found its way to a budget surplus. So what might an ideal American reform look like? It would include a lower capital gains rate, to be sure. This should be a no-brainer, since capital gains revenue seems especially responsive to rate cuts. The current slump is a great argument for Obama to give up his campaign-trail suggestion that he would increase the capital- gains rate to as high as 28 percent. What about the hoped-for recovery of 2009? The planned tax increases would diminish the effect of those billions for infrastructure, just as tax increases undermined the Public Works Administration or the Works Project Administration in the 1930s. ... the Democratic Party will now have to decide which is more important: its eagerness to trash the Bush-Reagan tax legacy, or its eagerness for recovery. As both Mark Perry and the Wall Street Journal recently have noted, the problem with the Detroit auto industry is not going to be solved by lending them more money. GM's labor costs are so far above those of any foreign competitor (or any industry for that matter) that there is only one solution: bankruptcy. GM could declare bankruptcy today, Toyota could buy its assets, and plants could reopen on Monday, offering jobs to those laid off that would pay wages competitive with those paid by other auto companies. The reorganized assets of GM would become instantly competitive. The auto unions are like a parasite that is killing its host, and it looks like they will succeed. But that doesn't mean the end of the Detroit auto industry, it simply means that eventually Detroit autoworkers are going to have to accept lower wages if they want to keep their jobs. The $25 billion bailout being discussed in Congress today won't do anything but postpone that day of reckoning. It does nothing to fix the fundamental problem, which is excessively high labor costs. The stock market is flirting with the lows it hit in October. I'm hopeful we don't see new lows, and I base that optimism on the following observations. Key measures of fear are all lower now than they were then: the Vix index is 65 now vs. 90; the TED spread is 197 vs 460; 2-year swap spreads are 102 vs. 155; 10-year swap spreads are 40 vs. 63; and junk bond yields are 20% vs. 22%. Other indicators are showing significant improvement in the economic fundamentals: the dollar is up 7%; bank reserves are up 66%; raw industrial commodity prices are down 12%; oil prices are down 25%; and real estate prices are lower and sales volume is up. In short, while the stock market is still plenty fearful, the inner workings of both the market and the economy show that stress and fear have subsided to an important degree. We went for a walk on the beach this afternoon, and were lucky to catch a beautiful sunset. These were taken with my iPhone. 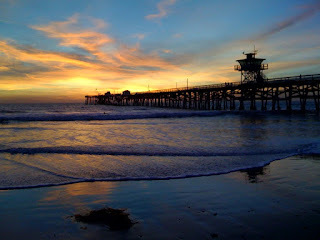 The first shot is of the San Clemente pier just a ways north of us. 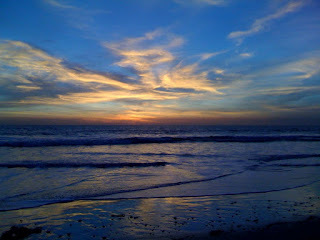 The second shot was from Calafia Beach. This beats watching the markets. It's apparently not fashionable to talk about the good economic news, but the dollar is up over 20% from its recent all-time low last July. And that's not all: with a stronger dollar have come weaker commodity prices, and that is very good news indeed. Since last July, oil is down 65%; copperis down 58%; non-energy spot commodity prices are down 30%; lumber prices are down 28%; natural gas is down 52%; shipping rates are down 91%; and gasoline prices are down 46%. What this means is that consumers' purchasing power has received a tremendous boost in the past four months. (A pessimist would say that four months ago consumers' purchasing power was seriously eroded, but it has made a strong comeback since.) The dollar not only buys 20% more of everything overseas, but it now buys almost twice as much of the raw materials necessary to make our economy run. This reflects a major and fundamental shift in the underlying dynamics of the global economy. Some worry that we are about to enter into a paralyzing period of deflation, but that's not the message I get from sensitive prices. Take gold, for example. It is down 25% from its July highs, but it is still up 180% from its 2001 lows; at $732 it is still saying that inflation is more likely than deflation. Rather than tipping into a deflation, I think prices are telling us that we have pulled back from a debilitating inflation and now face merely a continuation of mild, but above-target inflation. Things could be a lot worse, that's for sure. Yet the market continues to behave as if all is lost. The pessimism is so thick you can see it. The ups and downs of the market continue to be driven by fear. The Vix Index is a good proxy for the market's fear, as it measures the implied volatility of equity options, and that in turn is an indication of how much risk the market sees in the future range of outcomes. This chart suggests that the equity market is depressed because the level of fear is inordinately high. Once fear subsides, then prices should drift higher. Fear is high because the market worries about the combination of the ongoing housing crisis and Obama's policies (e.g., higher taxes, bigger government, trade restrictions, union expansion) pushing the economy into a depression. In short, the market is behaving as if a perfect storm is approaching, with little hope that we can avoid a catastrophe. In order to keep the market at these levels, or to push it further down, the housing crisis needs to continue and/or Obama has to deliver the market- and economy-unfriendly policies that investors fear. If there is any sign of a bottom in housing or if Obama pays any attention at all to what the market is telling him (remember how Rubin convinced Clinton to respect the bond market), fear will subside and the market will rise. I've been worried about Obama's policies all along, but I think the chances of him implementing a series of economy-killing policies at this point in time in order to comply with liberal orthodoxy are not very high. Obama's future chief of staff, Rahm Emanuel, was one of the key players in the early Clinton years, and he knows what can happen if you push an aggressive policy agenda. The stakes this time are even higher, and so the Obama administration would be well-advised to tread lightly and pay all due respects to the market. Still, we need to wait awhile to see what happens. In the meantime, how long can investors ignore the huge prospective returns now promised by stocks and corporate bonds? If things don't get worse, there are huge gains there for the taking. You are being paid a lot to take risk these days. The turmoil in financial markets continues. The bad news is everywhere. A new President is coming, but we don't know yet what he plans to do. The equity market has been hammered. The bond market is expecting massive bankruptcies. Fear is rampant: the TED spread is still 200 bps, and the VIX is still extremely elevated (61 today). But one thing has almost gotten back to normal: 10-year swap spreads. This is a very important first step on the road to financial and economic recovery. Note in the chart above that swap spreads started declining before the recession of 2001 hit. Spreads peaked in early 2000, well before anyone even suspected a recession was coming. They peaked at about the time that monetary policy was tightest, so tight that the yield curve was inverted (i.e., when short-maturity yields were higher than long-maturity yields). (Tight monetary policy was the cause of the 2001 recession.) Spreads hit their lows in May 2003, just before the Bush tax cuts went into effect, and just before the economy started to boom in the latter half of 2003. Swap spreads anticipated the current crisis during the first half of last year. That they have declined significantly in the past few weeks is therefore a good indication that a healing process has begun. It may take months before any healing of the economy is obvious, but at least we know that one thing is almost back to normal. The rest should follow with time. Are swap spreads forecasting a huge corporate bond rally? Swap spreads tend to be leading indicators of the price of risky assets, especially in today's market. That's because the financial crisis we're struggling through is dominated by credit risk and more specifically counterparty risk. Big money is afraid to trade because of the risk that their trading partner might be the next institution to succumb to a government takeover or fall victim to plunging prices on subprime-related assets. High swap spreads represent the level of fear that is gripping the market. Markets have been frozen as a result, with liquidity all but nonexistent. With some institutions still being forced to sell assets into an illiquid market, prices have been severely depressed, and yields have soared. Things are improving on the margin, however. Swap spreads have come down meaningfully, but are still abnormally high. As this chart shows, short-maturity swap spreads have been a good leading indicator of the distress in the junk bond market. In the past few days, yields on junk bonds have finally started to come down from the stratosphere, following the lead of declining swap spreads. If both these trends continue, high-yield bond prices are set to soar. I finally have to drop my skepticism about this being a recession. Job losses reported today were the tipping point. Still, we're not any where near a depression. So far, this recession looks a lot like the last one as far as job losses, and the last one was the mildest on record. If we just look at private sector jobs (ignoring government jobs because they can be created by politicians without regard to whether they are needed or not), so far we've lost between 1.5 and 2 million jobs since the peak of employment last year. (This second chart shows two different measures of jobs based on two different types of surveys, neither of which is perfect.) In the 2001 recession we lost a total of 2-3 million jobs. Interestingly, despite the much weaker than expected jobs report this morning, the market is up. That can only mean that the market was priced to very, very bad news (I still hear lots of people talking depression). The good news is that markets are clearing, companies are restructuring, most of the subprime losses have been taken, the Fed is super-accommodative, and swap and credit spreads are coming down. Oh, and also it's good to see oil at $60/bbl rather than $150, gasoline prices down by almost half from their summer peak, the dollar up 20% from its summer lows, and industrial commodity prices down 30%. Prices in general are back to more reasonable levels, and that includes housing prices. That's exactly the sort of thing you want to see. Finally, Baltic freight rates, which had been in free-fall since May, have ticked up in the past few days. There is definitely light at the end of this tunnel. Inspired by a post by Mark Perry, I put together this chart using the latest data from the Federal Reserve. As I have noted several times before, the popular notion that the economy is at great risk because bank lending has stopped dead in its tracks is completely erroneous. Lending by all commercial banks now stands at an all-time high, and is up 9.2% in the past 12 months. I've drawn a trend line on the chart which is instructive. Over the past 36 years, bank credit has increased by a compound annual rate of 8.4% per year, only slightly faster than the 7% per annum increase in nominal GDP. I don't see how this adds up to the assertion, as many claim, that a massive credit expansion is the root cause of our current crisis. Our current problems have nothing to do with a shortage of money or too much credit; rather, it is all about a shortage of buyers and a lack of confidence. And that in turn is being driven by the fear of defaults triggered by falling housing prices. Once prices stop falling and/or the market prices in the full extent of the likely losses, the crisis can begin to wind down. I think we're already in the early stages of that process. Weekly claims for unemployment hit a high of 499K on Sept. 26th and have been essentially flat to slightly down for the past six weeks, with today's number coming in at 481K. This is not a picture of an economy spiraling into a depression. In fact, it looks like energy and commodity prices have stopped falling, as well as the Baltic Dry shipping index. We may have seen the worst. Swap spreads are declining across the board, as government efforts, led by massive Fed injections of liquidity and direct purchases of commercial paper, gradually restore some confidence to the institutional money market. Think of swap spreads as a tax on transactions between major players in the fixed-income and equity markets. By late September the tax had risen to a point that transactions virtually ceased. That meant liquidity had evaporated and it left the market paralyzed with fear. The tax is gradually coming down, and liquidity and confidence are gradually returning. It is encouraging to see news reports about how money market funds are returning to the commercial paper market. I've noted before that swap spreads tend to be leading indicators of improvements in other areas. (They don't get much attention because they are not something that the great majority of investors uses or even understands.) They accurately forecast the huge rally in corporate bonds and stocks that started in late 2002, and as this chart suggests, rising swap spreads in September were a good advance indicator of equity trouble in October. They have to come down a lot more before we're out of the woods, but they continue to move in the right direction. Getting our financial markets back to some semblance of normality is essential to restoring the health of the economy. Obama, the candidate less friendly to capital and markets, will be our next president. I think the prospect of an Obama presidency has concerned the markets for some time, contributing to depressed valuations in recent months. If we knew with certainty that he would raise the tax rate on capital beginning next year, we would be well-advised to sell any stocks this year that we are holding with gains (and with the market down this morning, some appear to be doing that already). And on the margin, we would all be less eager to buy stocks, since the after-tax reward to owning them would be less in the future, and that's not good for stock prices either. But we don't know for sure what will happen next year. It's hard for me to believe that any new president would make it a top priority to raise taxes on the rich and on capital when the economic outlook is as uncertain as it is today. It's more likely that fiscal stimulus would get top priority, and it's not farfetched to think that Obama would prefer rebate checks and infrastructure spending to tax cuts. In my view this would do little to improve the long-term outlook, but at least that wouldn't be as harmful as higher taxes. In any event, the market is still deeply concerned about the future, so the question we need to ask is whether the worst that Obama could do has already been discounted into prices. I suspect it has. Thus, the primary issue for the immediate future is the return to health of our financial markets. On that score, it is clear that progress is being made. Key measures of fear (e.g., implied volatility) are trending lower, and key measures of liquidity (e.g., the TED spread and swap spreads) are showing ongoing improvement. If financial markets regain some semblance of normalcy, this would be a huge positive for the economy, since it would create a positive feedback loop that could pull us out of this mess in fairly short order. Optimism would therefore seem to be the preferred state of mind at this point, even if one is depressed at the prospect a leftward policy lurch in the future.